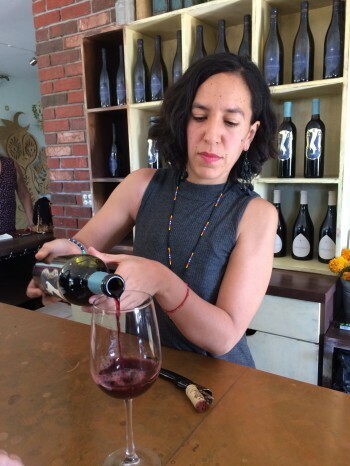 Every time I visit the glorious Valle de Guadalupe I find more treasures: innovative cuisine, exceptional wineries, comfortable accommodations, majestic scenery, and friendly, welcoming people. My last trip with a group of food and wine writers from the International Food Wine & Travel Writers Association was no exception. 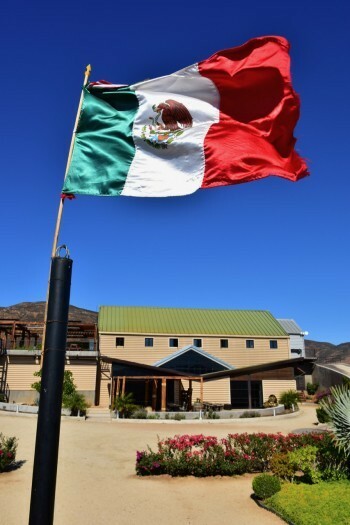 The Valle de Guadalupe is easily accessible from Los Angeles or San Diego since it is only about two hours from the California/Mexico border and 14 miles north of the city of Ensenada. The drive over the border and then along the picturesque, rocky coastline sets the tone for the experiences to come. The valley runs about 12 miles inland from the Pacific Ocean and at a 1000-foot elevation offers an ideal grape growing climate, much like southern California, with hot days in the summer and cool nights most of the year. The daily temperature differential can be more than 40 degrees. A stop at Museo de la Vid y Vino is a perfect introduction to the rich history of the wine region. This modern, enlightening museum traces the establishment of the first wineries in the valley in 1521 by Spanish missionaries to the thriving wine region the area is today. We learned that the Valle de Guadalupe is the oldest wine-making region in the Americas. After the missionaries planted the earliest vineyards, Russian immigrants in the early 20th century established their own vineyards, some of which still exist. Today the valley has designated its own wine trail (La Ruta del Vino) and has more than 90 wineries. There are many comfortable and unique accommodations in the Valle de Guadalupe area—from small, intimate inns and bed and breakfasts to larger hotels. This trip we stayed at two different hotels and I would recommend both of them. We loved Hotel Boutique Valle de Guadalupe, a hacienda-styled hotel set among vineyards. Our two-level room (one bed up, one bed down) was cozy with a working fireplace and colorfully decorated. We wished we had had time to enjoy an upper deck open-air restaurant that looked very appealing. Our lovely room at the Banjamar Oceanfront Golf Resort was spacious and comfortable with beautiful views of the golf course. A spa and restaurant were also available. We enjoyed tasting wine at Adobe Guadalupe Vineyards and Inn, but did not stay there, although it is certainly on our list of desired accommodations for a future visit. Surrounded by 60 acres of lush vineyards, this welcoming hacienda with six rooms is highlighted by a beautiful central courtyard, stunning artwork and European decor throughout the property. 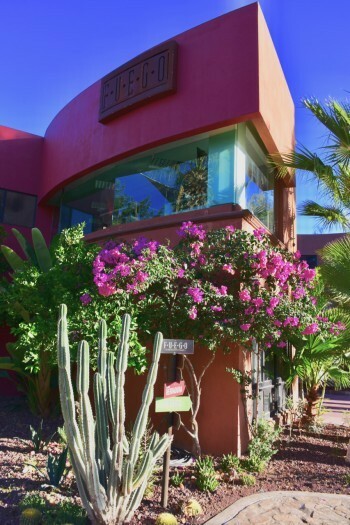 From May to October, this inn also offers guests a mainly outdoor restaurant called El Jardin. 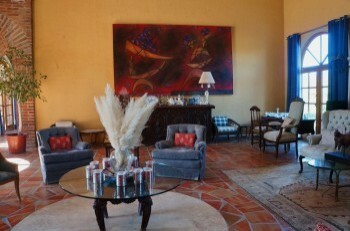 The menu features traditional Mexican dishes and breakfast is offered to guests daily. This was my 4th trip to the Valle de Guadalupe. Each time I venture south I discover new wineries that surprise and delight me with their exceptional wines and frequently with their striking architecture. Many of these wineries are family owned and the pride of ownership shines through in the friendly service. The wineries we visited during this recent trip were no exception. 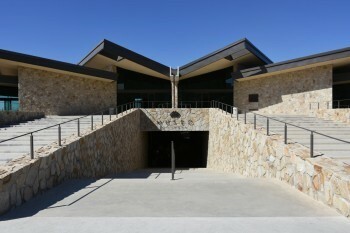 Decantos Winery is situated in a stunning multi-level building built into a hillside with impressive views of the valley. The winery is owned by the Granados family and run by brothers, Alejandro and Alonso. 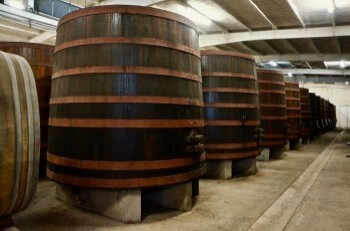 Uniquely, the winery forgoes mechanical pumps for transfering wine during production and instead uses gravity. 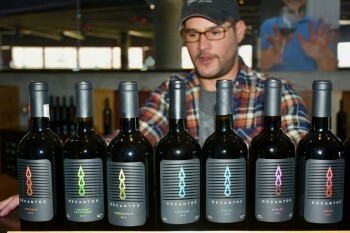 This gentler production approach results in wine that the brothers feel is superior in bouquet, color and taste. I especially enjoyed the rich Amarone, the spicy Tempranillo, and a superb intense red blend called 981. Another family winery success story began in 1926 when Don Angelo Cetto left Italy because he was attracted to the climate and ideal growing conditions he found in Baja where two years later he planted grapes, initiating a wine growing legacy that continues today. Louis Augustin Cetto, a winemaking pioneer in the valley, founded L.A. Cetto Winery in 1975 and today Luis Alberto carries on the tradition. L.A. Cetto is one of the oldest wineries and now is the largest producer of wine in Mexico. We tasted a variety of wonderful wines here and I could understand the winery’s popularity. I particularly enjoyed the crispy 2015 Sauvignon Blanc with apple and citrus flavors, and the 2014 Petite Sirah, which was intense with dark cherry notes. But there were so many other good wines at this winery. Finca la Carrodilla was the first organically certified winery in the valley. The winery is named after the Virgin of La Carrodilla, protector of wines in the famous wine region of Mendoza, Argentina. A shrine to this saint watches over a lovely roof garden on the upper level of the winery. The saint must be doing a good job of overseeing this winery since the wines we tasted were exceptional. I savored the elegant 2014 Shiraz, which had a subtle sweetness, and the 2014 Cab Sauvignon with its deep red fruit flavors and a touch of spice. A modern but warm architectural style made us all feel welcomed in the tasting room. Grape crushing takes place right next to the tasting room on the upper level, while fermentation, aging, and bottling take place below in cooler temperatures. The winery’s twenty-acre property includes lush vineyards and a spacious organic herb and vegetable garden that provides produce for many local restaurants. Agua Mala Brewery is a small microbrewery in Ensenada, owned by an entrepreneurial couple, Ashley and Nathaniel Schmidt, who started this venture in their kitchen. This is the third time I’ve visited this congenial brewery and every time there are more artisinal handcrafted beers to enjoy. The setting for tasting, a second floor “beer bar” overlooking the ocean, is a place where you could sit all day, contemplating life and savoring the special brews. The name of the brewery and the names of the beers are all related to the sea. Agua Mala is actually a jellyfish that floats off the shores of Ensenada. For instance, Marea Roja means "Red Tide" and refers to the widespread red tide infestation that hit the area in 2005 when the beer was created. Sirena, meaning "mermaid," is a popular Pilsner. Mantarraya is a nutty dark beer whose name means "stingray." And the imaginative names go on and on. 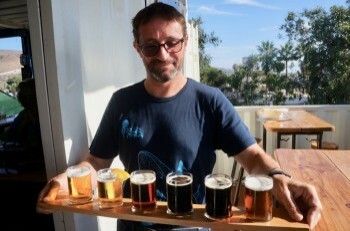 This is a must-stop place for beer lovers in Ensenada. Of course, a visit to Valle de Guadalupe is not just for tasting wine and beer. The evolving cuisine scene is equally tantalizing. In a future article we’ll focus on some of the outstanding restaurants we experienced during this visit. We were graciously hosted on this trip by the Secretaria de Turismo de Baja California.